On the first day meet you in Tanger, the gateway to Africa from Europe and driving along the stunning coastal road via a beautiful towns of Asilah and Larache with its whitewashed and blue walls ... After the lunch in Rabat, your sightseeing in our administrative capital will include the Hassan Tower and the Mohammed V mausoleum, the bustling Oudayas Kasbah (the old medina of Moriscos) overlooking the Atlantic Ocean and offering fabulous views. Diner and overnight in Rabat. 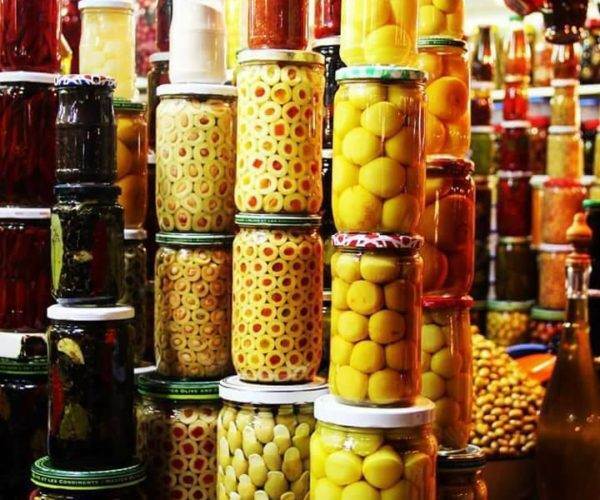 After breakfast, you take the road to Marrakech via Casablanca, the largest city and commercial capital of Morocco. We will visit the majestic Hassan II Mosque and lunch. After pursuing our road to Marrakech and check you in your home. You take rest before the discovery of the Jemaa el Fna (Marrakech by night) with the old medina known about its huge market. 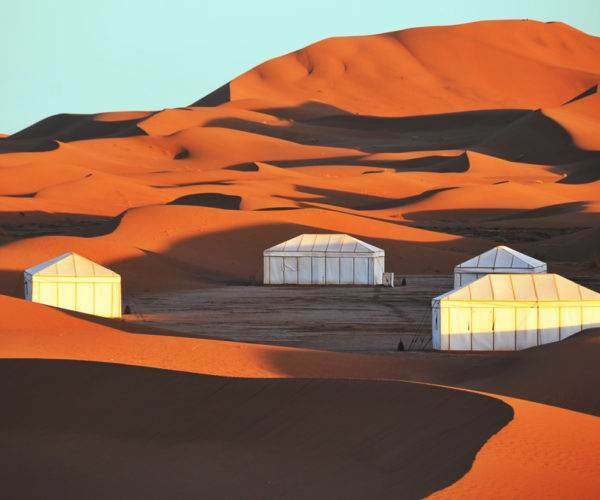 The entire day is devoted to explore Marrakech the red and the second oldest Imperial city. 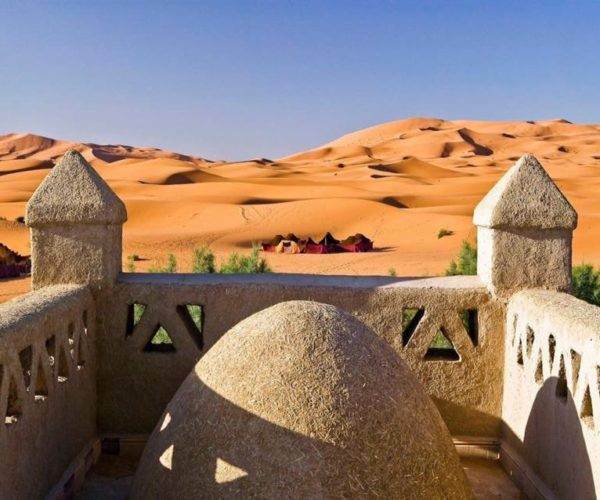 On the morning you will have a guided tour visiting the most important places, the Koutoubia Mosque with its garden dominating the centre of Marrakech, the Saadian tombs, the Bahia Palace and Ben youssef koranic school. after your lunch in some restaurant in the medina, you meet again with our driver to visit the Majorelle and Menara gardens. after free time and you back to your hotel for the overnight. 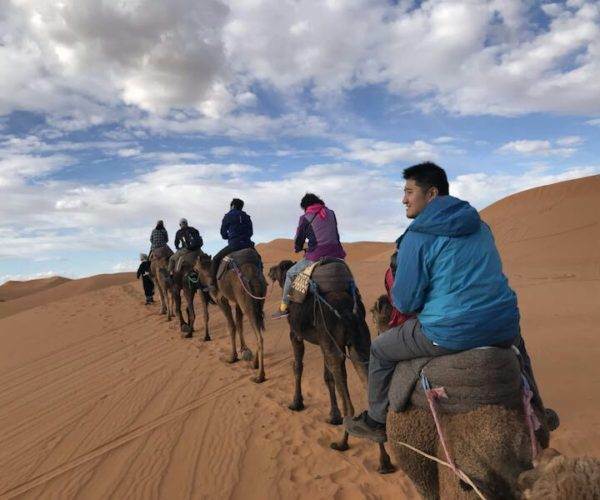 Departure early to the famous Roses Valley via Ouarzazate (the African Hollywood) crossing the High Atlas by Tichka pass (2260m). 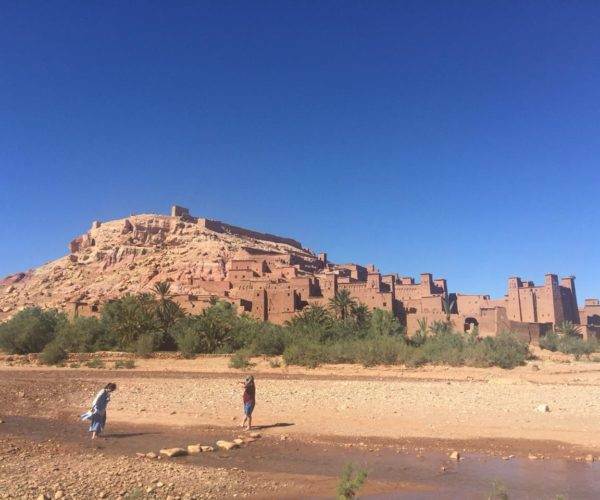 Visit of the celebrated Kasbah Ait Ben Haddou where they filmed many movies and which is declared by Unesco as World Heritage and lunch on site. 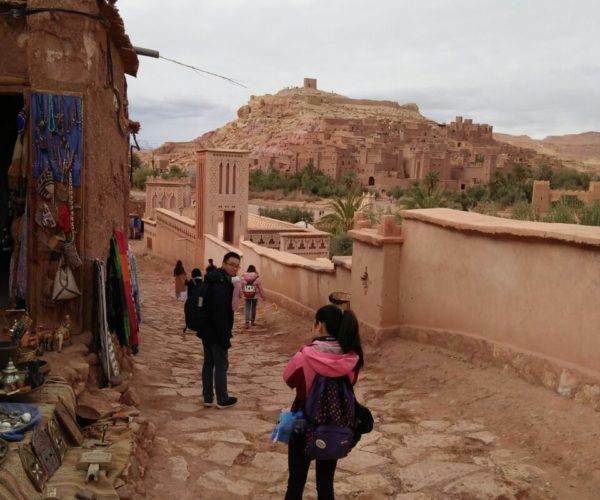 Afternoon a visit or photo stop at the studios center and the Kasbah of Taourirt in Ouarzazate. 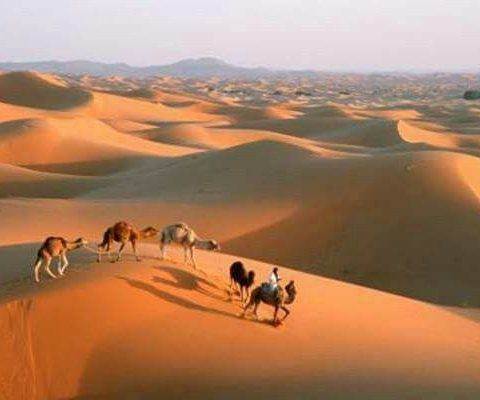 Then continue on the road of thousand kasbah to reaching the roses valley in Kalaat M'gouna. Overnight in a Kasbah/Hotel. 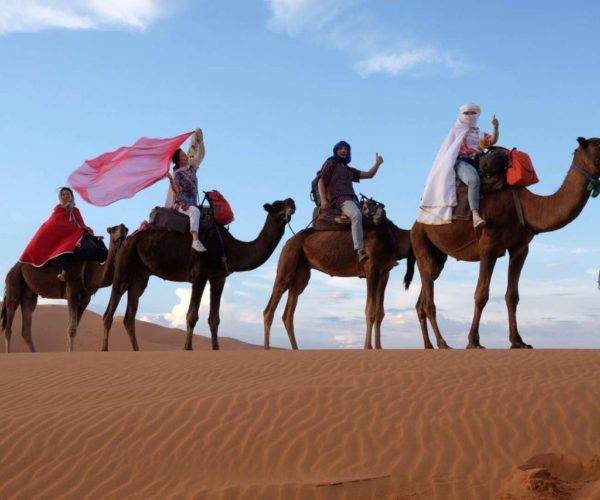 After your breakfast, you will travel towards the desert of Erg Chebbi through the way of the thousand kasbahs providing numerous opportunities to take pictures. 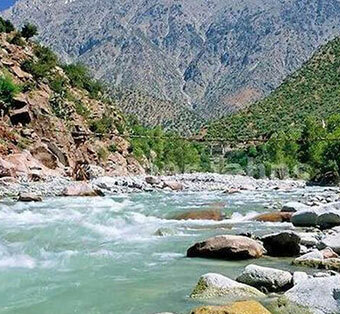 We will visit the Dades valley, the valley of Todra and its gorges with a short walk, then the ancient irrigation systems in Jorf, the marble factory and fossils of Erfoud. The lunch will be in the road, then visit the Moulay Ali Cherif Mausoleum and Ksar Abd el Halim in Rissani. 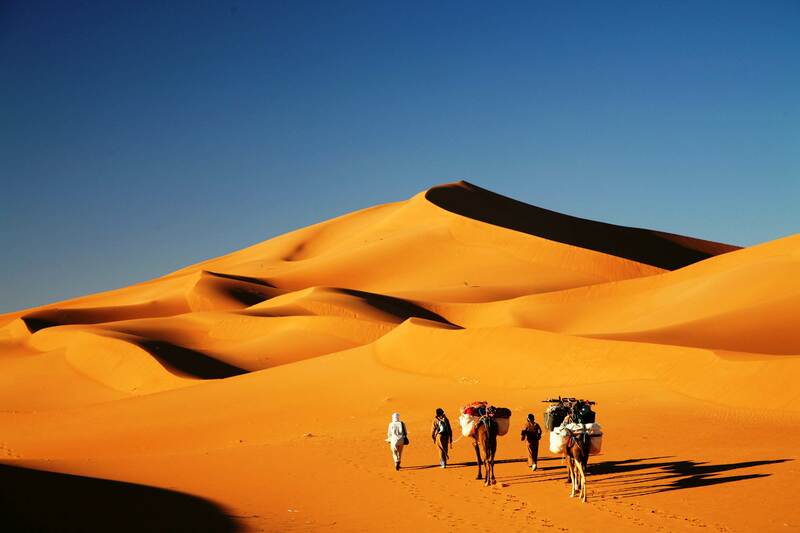 Arrival at Merzouga dunes before the sunset, overnight in a Kasbah/hotel. At 9 am after breakfast, we'll start for the grand tour of the dunes to explore the saharan life crossing a desert plateaus as dried salt lakes and rivers, black desert with volcanic stones, the tracks of Paris-Dakar a tea with the local nomads, small oasis-villages as Khamlia, the village of blacks (Gnawas originals of Sudan). Lunch will be on the road as a picnic in an oasis where in a restaurant. 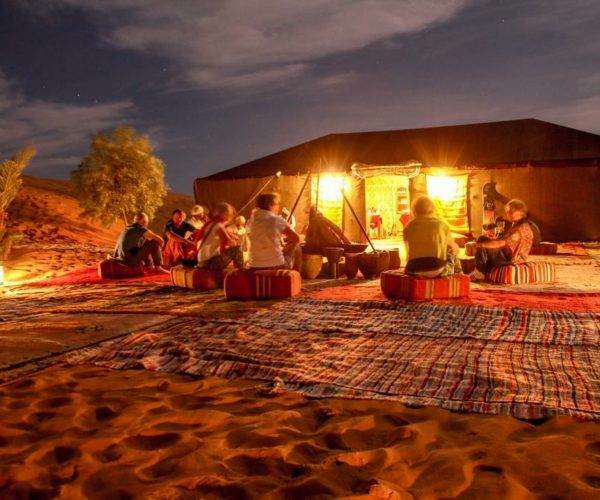 After we return to the hostel to prepare starting of your camels adventure to witness the sunset and sunrise in the desert, enjoying a quiet night with local animations and shooting stars ... Overnight under a nomad tent in private desert camp. After your bivouac back, breakfast and shower. 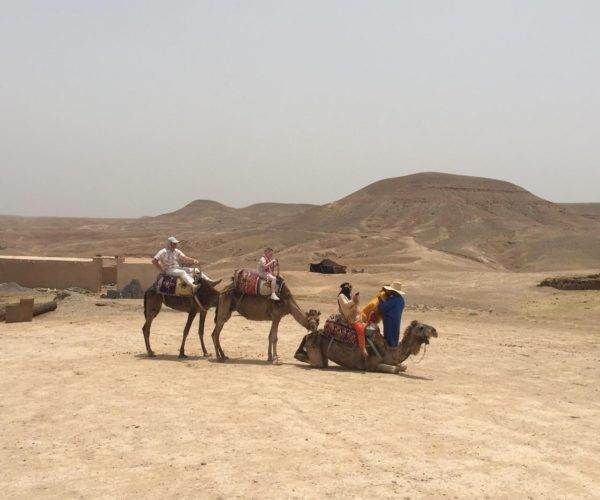 We will ride to Fez through the Ziz fascinating valley dotted with palm trees and fortified Berber villages staying with a beautiful view. After crossing the High Atlas by Tizi n'Talghmt (from 1970m) is Midelt (the capital of apples) and lunch. 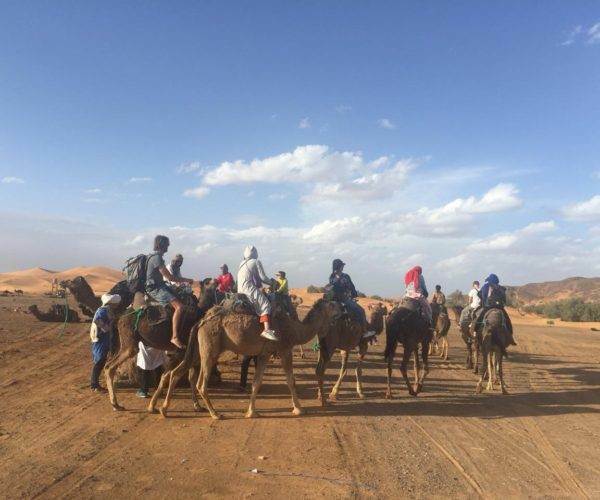 Afternoon we will continue via the Middle Atlas by the passage Zad (2178m) and a photo stop at the cedar forest of Azrou and Ifrane (Switzerland of Morocco) to reach Fez late evening, dinner and overnight in Riad/Hotel. 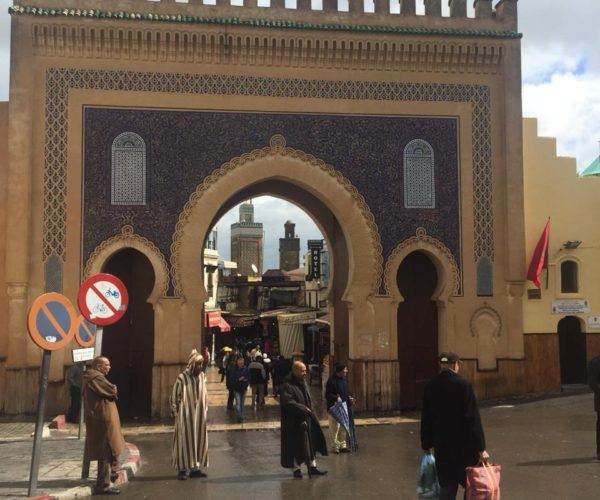 The whole day will be a tour of the city dedicated to the discovery of Fez, the oldest city in Morocco, founded by Moulay Idriss II. 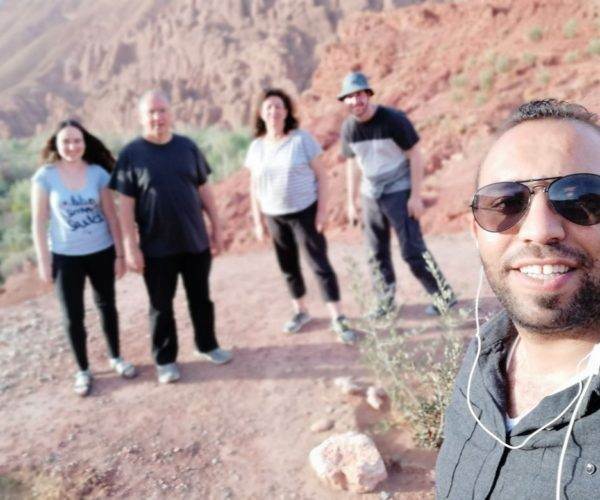 We visit the gates of the Royal Palace, the old Jewish quarter, the first Mellah in Morocco built in the 16th century, the Merinides tombs with magnificent panoramic views of the medina and the area of local pottery. 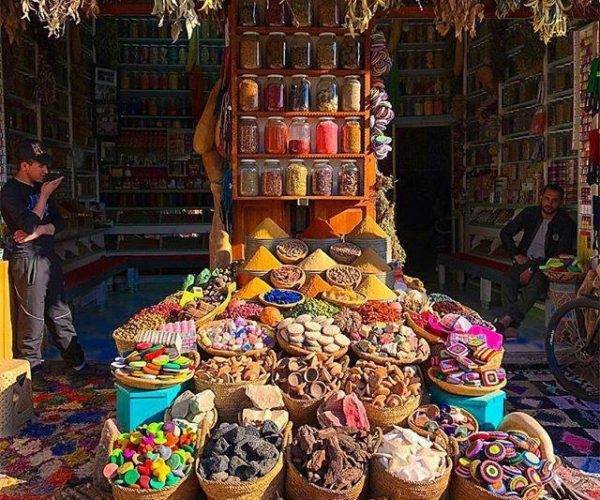 In the afternoon after lunch, walking in the narrow streets visiting the medina and its souks, the madrasa Bou Inania, instead Nejjarine and Karaouienne Mosque. Then back to the hotel and night. 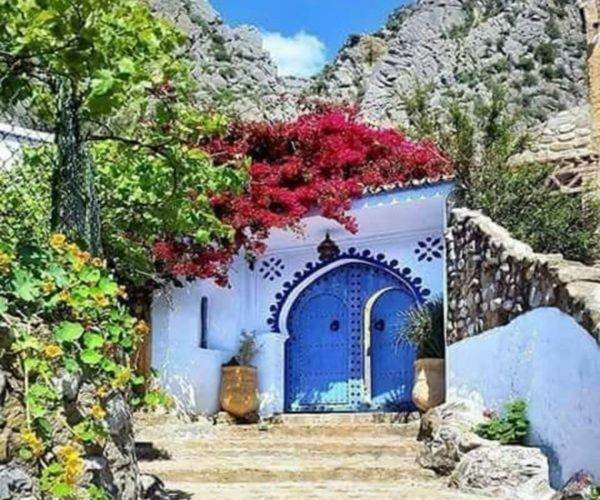 Early departure to Chefchaouen, we continue our trip to this enchanting mountain village of crossing the Rif mountains with a scenic route that takes you from above with magnificent views. After Ouezzane city, we arrive in this blue-white city in full green nature. 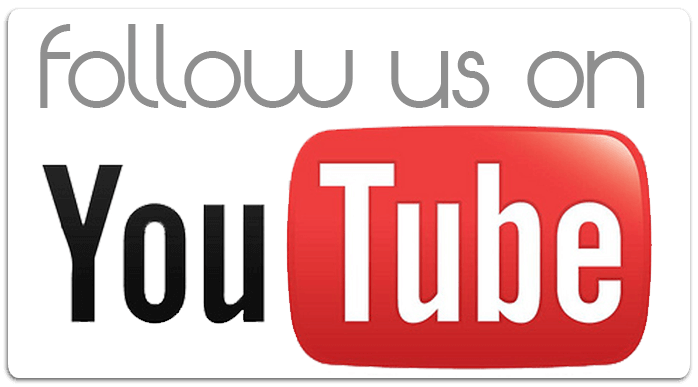 You will have lunch in a typical restaurant in the area, then you will have time to visit the old medina with its beautiful waterfalls nearby. This fortified village of Spanish style surrounded by many arts and crafts stores, typical restaurants and cafes. Overnight in Riad/Hotel.